People probably first reached Japan from two directions around the same time. Some people came north from Southeast Asia or Australia, in boats along the coast. These people were descended from the first people who left Africa about 70,000 BC, and they had dark skin. A second group of people came from the grasslands of East Asia, walking across a land bridge caused by the Ice Age. They were descended from people who left Africa later and headed north, and they had lighter skin so they could get more Vitamin D from the scarce northern sunlight. They may have brought their dogs with them. Both groups got to Japan about 40,000 years ago. They must have been surprised to see each other! These people all had a Paleolithic (Old Stone Age) culture when they arrived in Japan: they made their tools out of flint and obsidian, they used baskets, and they hunted and gathered all their food. 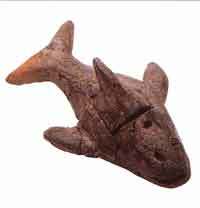 They used bows and arrows – sometimes poisoned arrows made from poisonous fish spines! – to hunt wild horses and deer. They were nomadic. Sometimes they lived in caves, and later on in thatched pit houses about fifteen feet square. Like other hunter-gatherers, they had no leaders, and were all equal – men and women, too. But by around 14,000 BC, the end of the last Ice Age brought a much better climate to Japan, with plenty of shellfish, salmon, and nuts to eat. People in Japan began to do some new things. Like the Chinook across the Pacific in North America, they started to settle down in villages. To preserve the fish they caught by fermenting it, they began to replace some of their baskets with the world’s earliest pottery, using crushed seashells as temper. 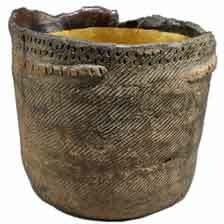 They thought of pottery as related to baskets, and often decorated it by pressing rope or cords into the sides. The Jomon people were rich and there were a lot of them. Some of them left Japan around 8000 BC and moved to East Asia; others went the other way, around the edge of the Pacific through Alaska to the Americas. Warmer weather encouraged people to live up in the central mountains, where it was cooler, and they may have experimented with farming. Then, starting about 1500 BC, cooler weather drove people back down to the seashore, and they started eating a lot of fish again, this time using deep-sea fishing and harpoons. About 800 BC, Chinese Zhou Dynasty farming methods reached Japan, possibly with an invasion of Zhou Dynasty people. Japanese people began to grow and eat a lot of rice with their fish. (It’s possible that this shift was a ripple effect of the same climate crisis that ended Egypt’s New Kingdom and the Hittite Empire.) Like other people who have just begun to farm, people in Japan also began to use bronze tools and weapons, and have wars over land, so that’s the end of the Stone Age in Japan. Cite this page: Carr, K.E. Stone Age Japan – Japanese history. Quatr.us Study Guides, July 27, 2017. Web. April 21, 2019.